“Horses are flight animals. They can’t lie. When they trust you, they come to you,” says real life horse whisperer Monty Roberts. What does the horse whisperer do for people with horse problems? “The truth is I help horses with people problems,” he says. His lessons are far more reaching. 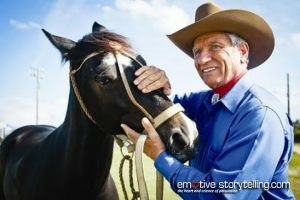 Monty Roberts, a real life horse whisper, has many stories to share when it comes to people overcoming trust issues. Especially military service members with PTSD. Throughout his distinguished career he has worked with Hollywood celebrities to the Queen of England. Monty has developed a means of communicating with horses. Yet he insists “I didn’t develop this. God did. It was already there. I just discovered it.” He emphasizes that through gestures and tone of voice, a difference can be felt naturally by horses. Certain gestures drive them away. Other gestures stop driving them away. And yet others invite them in for closer contact. “Horses are flight animals. They can’t lie. When they trust you, they are telling you the truth. When they trust you, they come to you,” says Monty. This is a truth of nature developed over six thousand years that very few have figured out. In response to seeing this after working with Monty on his ranch, the veteran says to the horse “I can trust you! I can trust this thousand pound animal which is almost ten times my weight.” That is a profound door opener. Establishing trust that often takes years to overcome can in similar ways begin a change in veterans, and do so in a fraction of the time of standard therapy. 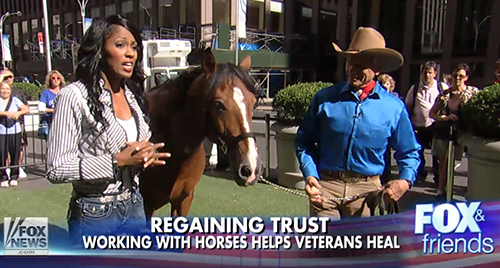 Monty’s Horse Sense and Healing program is helping veterans dealing with the side effects of their service overseas. The parallels to life and relationships are many. Service members have come back from deployments suffering from a number of significant mental health ailments. Retired Air Force Staff Sergeant Alicia Watkins experienced Monty’s program. She had frequent deployments to Iraq and Afghanistan and came back with Post Traumatic Stress Injury. She was also raped while on active duty and was at the Pentagon during the 911 attacks. Coming home from war, she found that nothing helped. She didn’t want pills. She didn’t want to be seen by a psychologist for the rest of her life. Exposure to Monty’s program made a difference. Combat veterans come back from war with no trust. 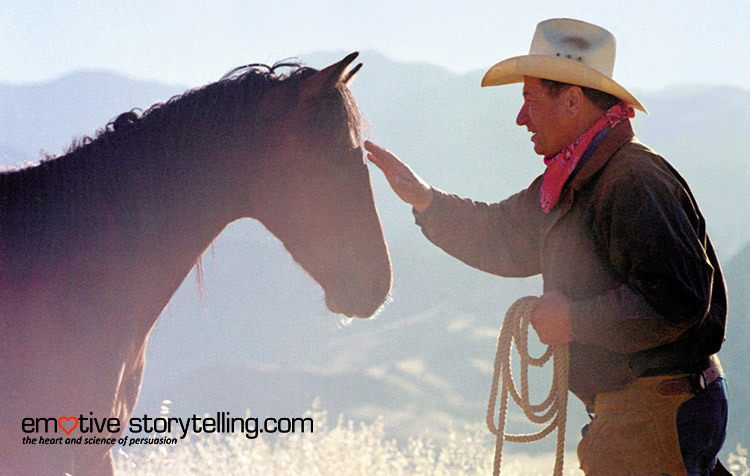 The horse whisperer sees relevance to his work with horses. Horses are driven away by open handed gestures, forward movements and sounds perceived as threatening which generate feelings of distrust. Yet by communicating differently, softly and calmly, using closed handed gestures, and moving slowly away in a non-threatening manner, the horse can be drawn closer. This occurs whether or not Monty has ever met the horse before. The right actions can draw the horse closer. This creates the opportunity for trust. So how does this help a veteran or people overall? Certain actions encourage trust. Flight animals don’t lie. If they trust you. They come to you. If they don’t trust you, they go away. Veterans have been washed of trust. They don’t trust anybody. When they see that a horse can trust them, veterans can believe it can be done again in other areas of their life. From this experience, veterans can begin to develop trust in themselves. This opens the door to trusting others. They can also start to deal with their emotions. They can begin to consider that when life hits them, they can calm down and get to a better place of understanding and healing. People who are able to mirror these ‘horse sense’ principles are better able to draw others closer and encourage the possibility of trust. Through use of non-threatening gestures, active listening, openness without judgment, enduring patience, authentic compassion and sharing of personal stories, the door to trust can crack open. Healing starts here. Emotive Storytelling™ encourages behavior change through the use of narrative communication, neuroscience, digital media, and mobility. Narrative Communication as a source of emotive persuasion and education has a long history and a sound scientific underpinning. Emotive Storytelling integrates the emotional power of the storytelling, cinematic technique, neuroscience, health games, mhealth (mobile health), digital tools and internet technology to drive user engagement, adherence and behavior change in healthcare delivery, marketing, education, and business.